The three of us decided to take a day trip. With the big girls still visiting the Grandparents in Colorado choosing something Adelynn would like to do was our focus. 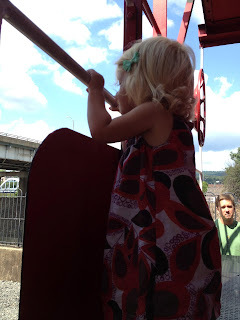 This little almost two year old girl loves trains. I can't figure out where this fascination came from but it is strong. Always willing to point out a train as it passes by in our town, usually as we wait at the crossing, she will very energetically draw our attention to them. 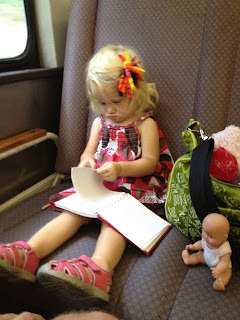 That's the nice way of saying she is nearly screaming "train" from the backseat until someone confirms her sighting. To do something different from sighting trains at stoplights Keith found a scenic train we could ride in nearby Maryland. 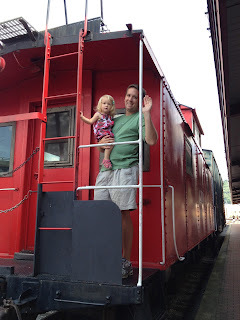 We took a very nice drive to Cumberland, Maryland to catch a train. 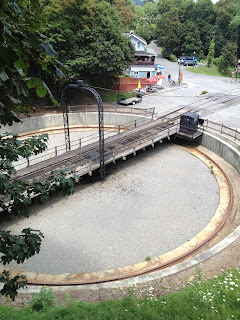 The Western Maryland Scenic Railroad station was our starting point for our adventure. The station dates back to the 1920's and still retains its nostalgic charm. I was loving the old feel of station. I have always loved seeing old buildings still functioning as it has from day one. This train runs 32 miles north to Frostburg where it takes a short break and then takes the return journey home. How fortunate for us to have an opportunity to ride a steam train. I'm not sure who was more excited Adelynn or Keith! We waited with what seemed like hundreds of people for our train, the 1916 Baldwin to arrive. This was my first time riding a railroad train so maybe I was a bit excited too. While we were waiting I noticed several people were taking this train to Frostburg so that they could ride their bikes along the trail back to Cumberland. That gave Keith an idea for our next trip to Cumberland. As we waited for our train we found plenty to see. Adelynn loved that caboose. When the train started to make its way to the station Adelynn and Daddy were ready to get up close. She was very excited until the SIZE of the train became clear. It was overwhelming. 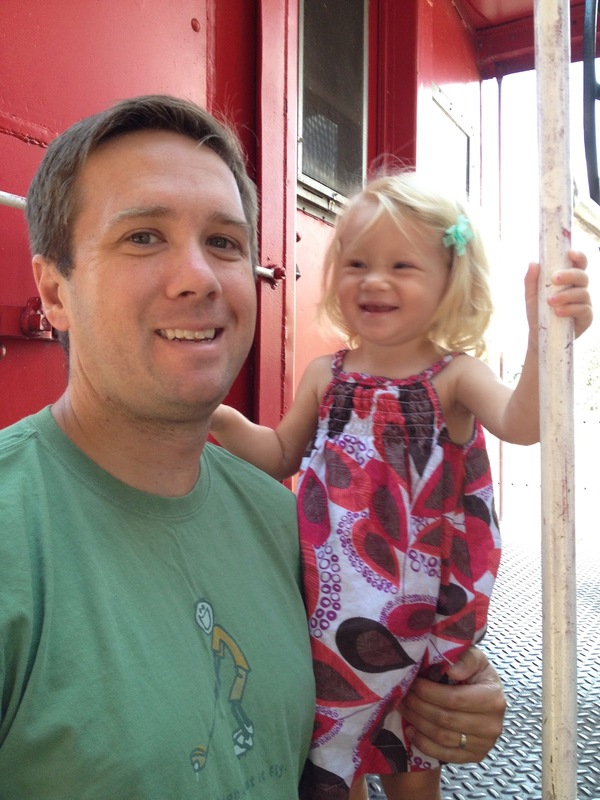 She held on to Daddy tightly until the train came to a complete stop. We had a few minutes to walk towards the front and see the engine. I never realized how wet the area around a steam train can be. After a good thorough look at the engine we made our way back to the line. We chose a seat on the right side of the train in a car towards the rear which was a great choice for having the best views for the journey. When you ride this train looking out the window is pretty much all you'll want to do. Well, unless, you are nearly two years old and then you'll have to find something else to do. Coloring was a big hit with Adelynn. She was a great travel companion. She enjoyed her popcorn with some juice and pointing out numerous things along the way. We all peered out the window taking in the sights. It was incredible scenery. Keith loved seeing the engine as we made hairpin turns. I'll agree it was very neat to see the train cars ahead of us on those turns. The route is most certainly scenic and just so pleasant. We enjoyed seeing numerous people along the bike trail as well as railroad crossings standing there to wave at us as we passed by. Which makes this trip a really great choice for something fun for the little kids. Upon arrival in Frostburg you are reminded of the limited time you have to explore. We had an hour and a half to grab a bite to eat and get back for the return trip. We would have liked to stay to the train table in action. From what we heard seeing it is well worth the time to wait. Next time we will pack a lunch to eat at the station so we can watch the train. Adelynn had such a great time seeing the train. Of course when your are nearly two most everything can be a great time. 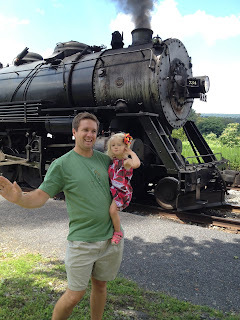 She even enjoyed a little dancing at the Frostburg train station. It was a great trip. We had fun taking a step back into time experiencing travel that is more relaxed. We will certainly return and maybe next time we will try riding our bicycles on the return trip.